Enjoying a day off today due to winter storm Nika, which now has Dennis hell-bent on getting himself a snowblower since we’re expecting even more snow this weekend. 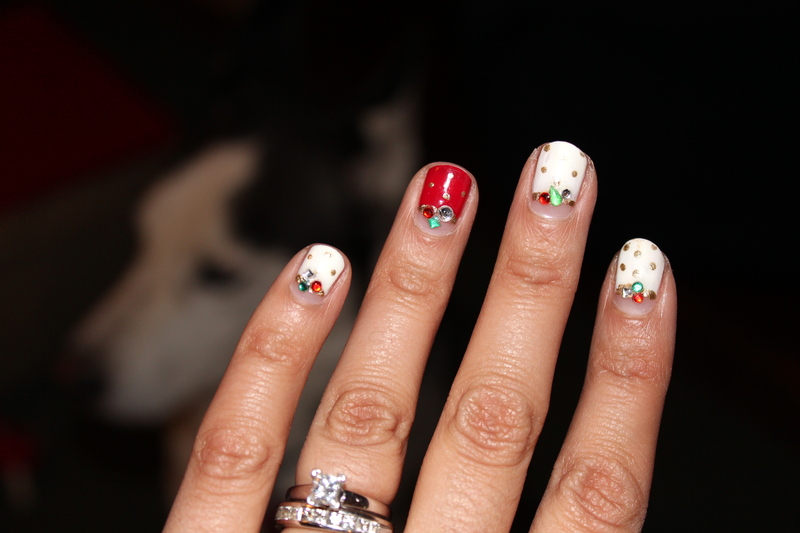 Meanwhile, I’ve been spending some time thinking up nail-art ideas, and wanted to share with you two recent manicures. 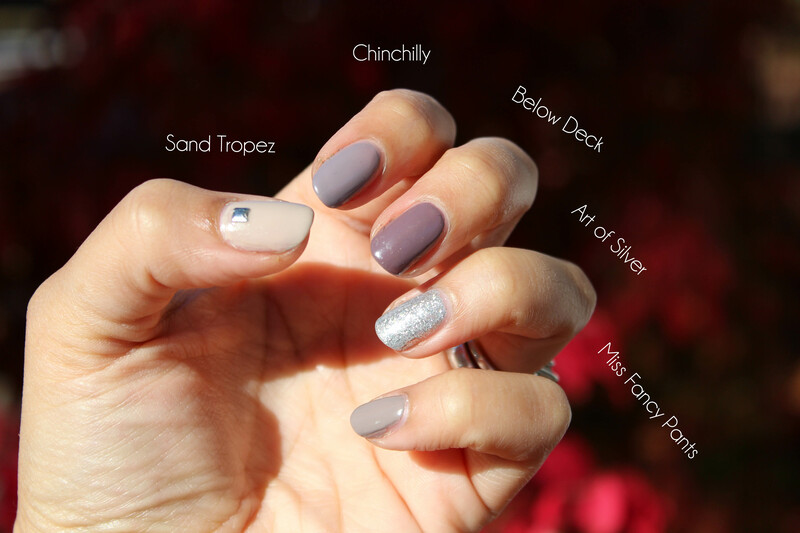 First is a liquid sand polish by OPI called Vesper. I found it in a discount bin at Ulta and have decided it’s my favorite of their liquid sands. I love the color and finish. It’s hard to photograph, but hopefully this photo does it a bit of justice. 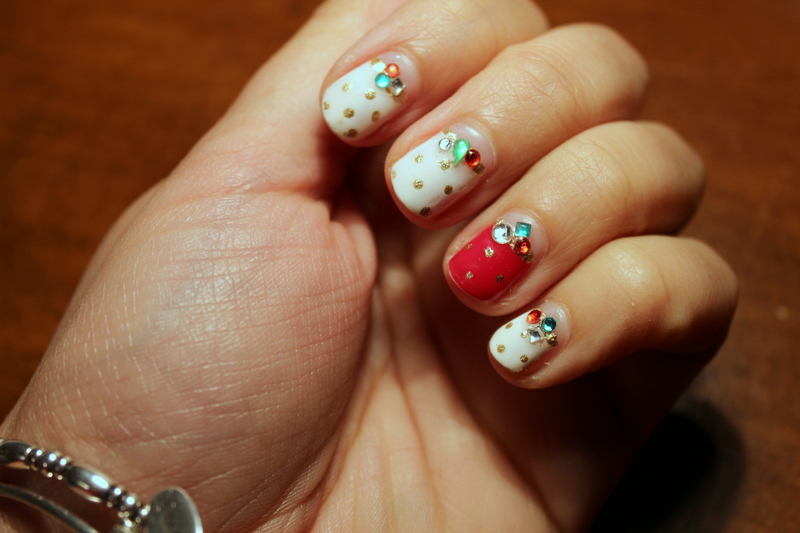 Secondly is this simple and quick Valentine’s Day themed mani, featuring simple little hearts at the end of each nail. 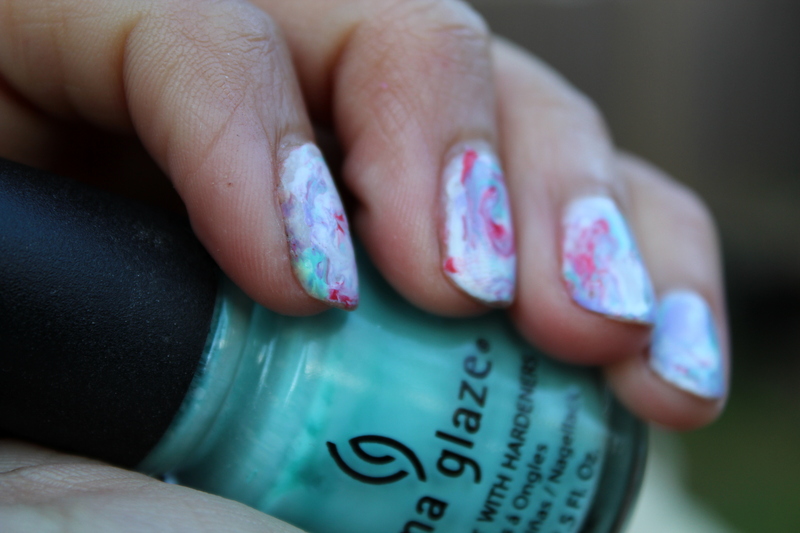 After a base coat, I used China Glaze Passion for Petals to create little heart shapes by painting on two swipes of polish at downward and intersecting angles. Top coat and done! Now back out to do some more shoveling – the more I shovel, the less we need a snowblower, right? Merry Christmas Eve! Have you finished your shopping? I had to exchange a few things this morning, which I thought was going to be a very bad idea as I was on my way to the mall, this morning, but it wasn’t too bad. Now I can finally say I’m finished. I’ve been busy painting my nails, too. 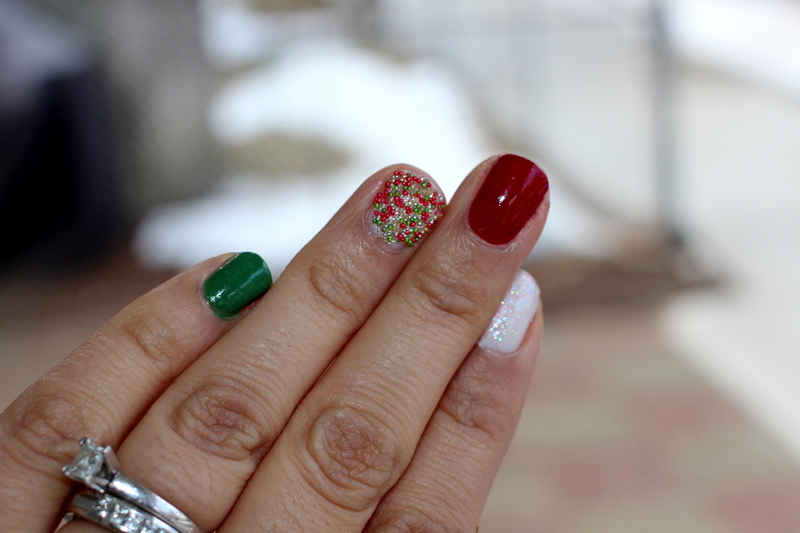 I have two holiday-inspired manicures to share today. 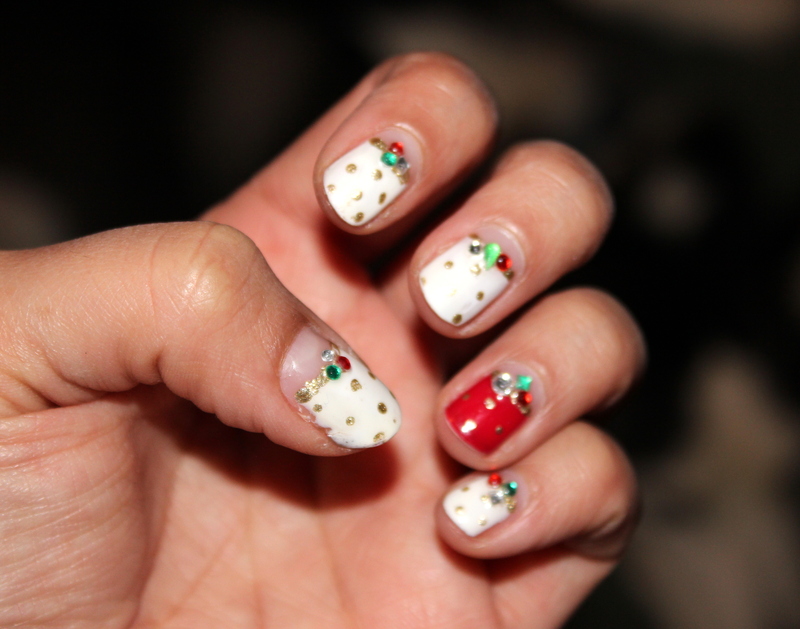 The first is a very red green and white manicure with a caviar accent nail. 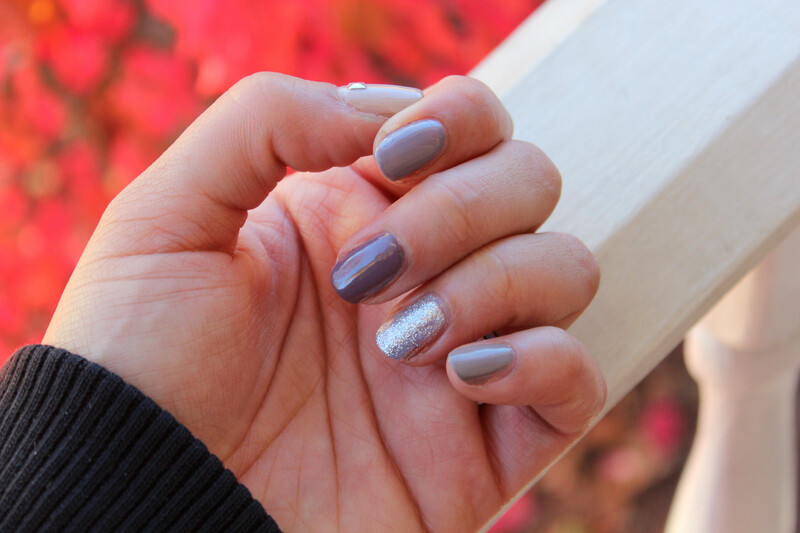 The second is a really simple manicure using flocking powder to create the velvet effect. It doesn’t really translate well in the photograph, but I love the texture the flocking powder creates. 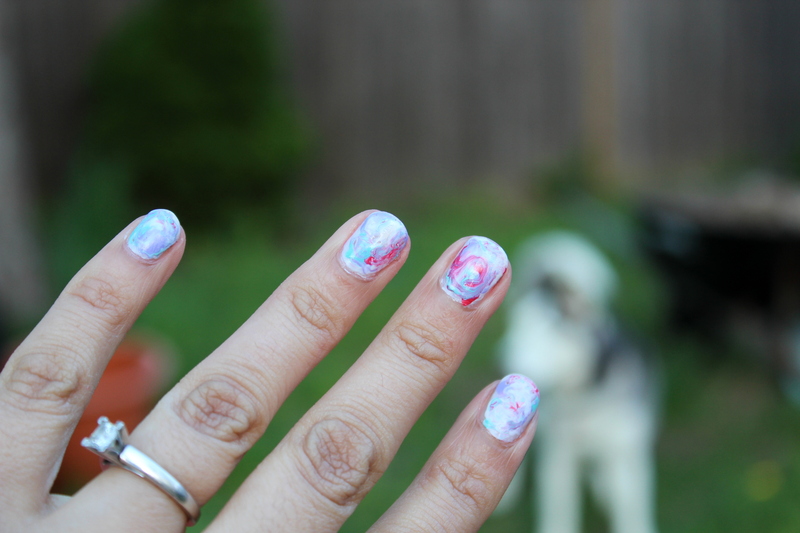 Radar is always somewhere nearby when I”m taking photos of my nails – and looking like a crazy person to everyone in the neighborhood. 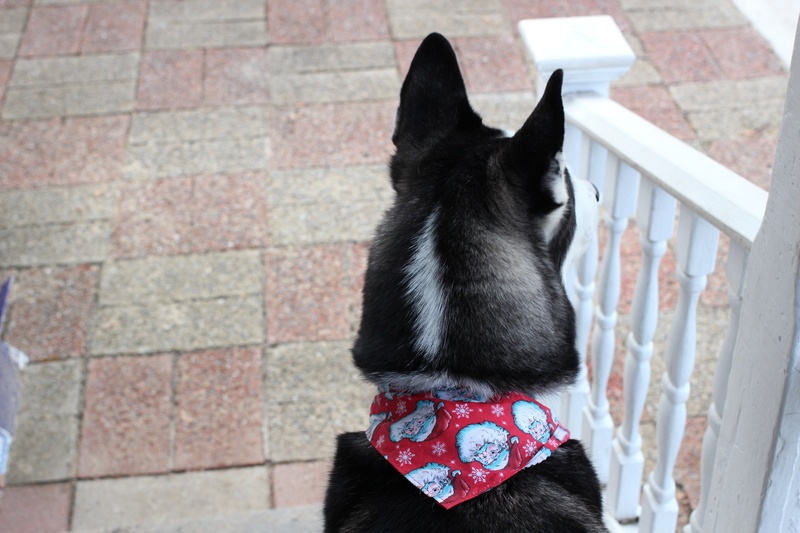 He’s on Santa-watch today. 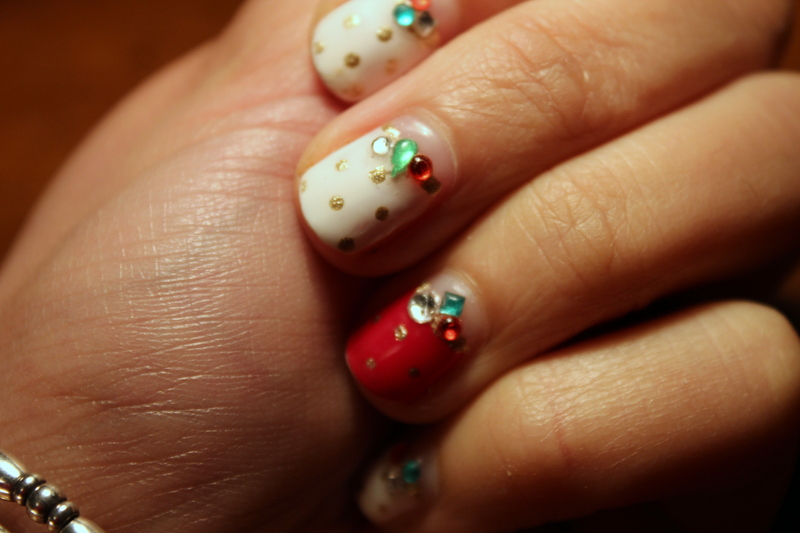 What are you wearing on your nails for the holiday? I also added a square metal stud to my thumb for a bit more…pizzaz? I used a little dab of top coat to affix the stud before coating the whole nail with topcoat to finish. 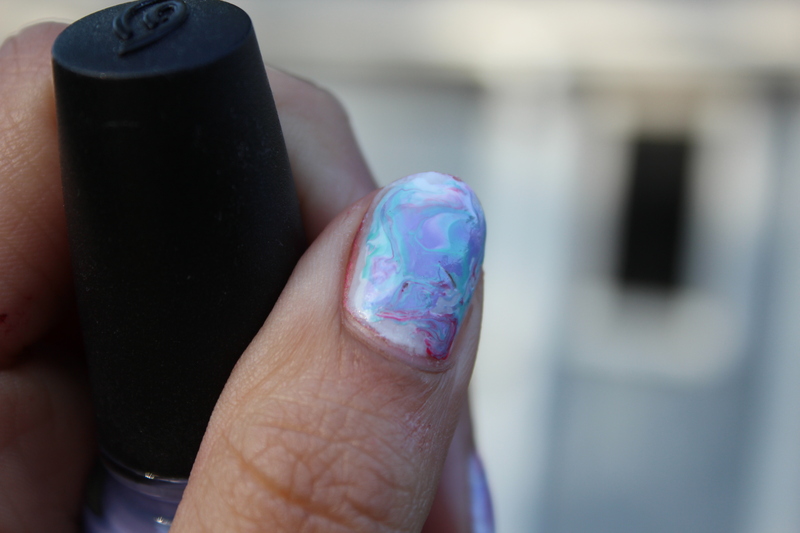 This midweek mani looks an awful lot like an ombre mani I shared a little over a year ago, except that I achieved the ombre effect for that mani by adding varying amounts of white polish to the same base color. This time, I didn’t necessarily follow an ombre pattern in going from left to right/darkest to lightest and instead I used different polishes but made sure to keep the colors all in the same color-family (so much easier). I really didn’t pay too much mind to achieving any kind of gradient effect. 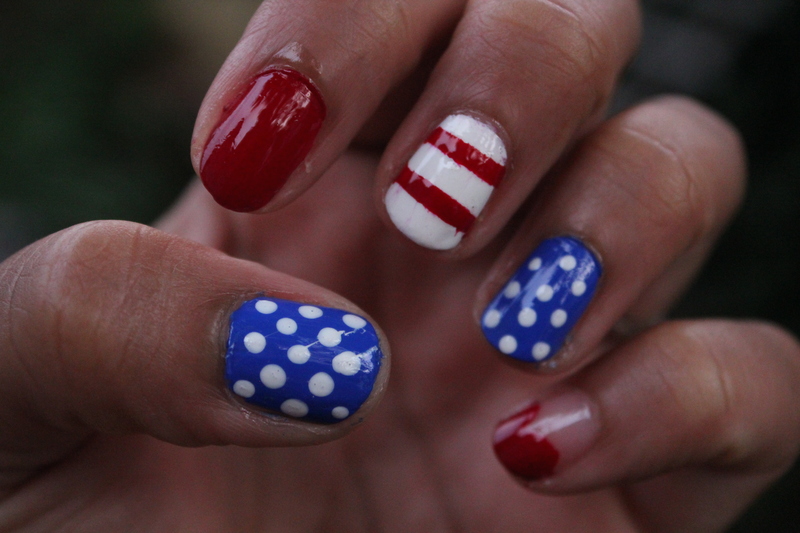 Gearing up for Independence Day next week! It’s my favorite holiday because I love the parades, and the cookouts…and the fireworks! Annnd it’s 3 days after my birthday and I like having an extra reason to celebrate! 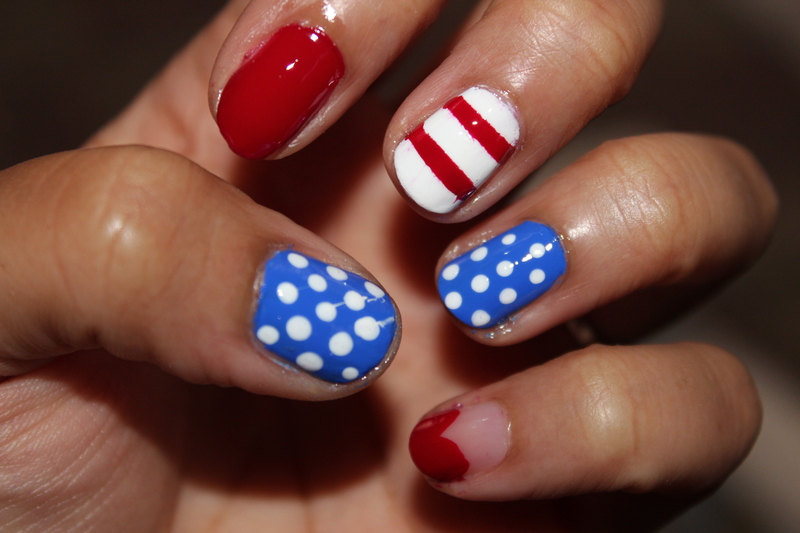 Grab yourself some red, white, and blue polishes and anything you conjure up will look pretty patriotic, if you ask me. I polka-dotted my ring and thumb fingers with white polish after painting on a bright blue base color. * For the red and white striped nail, I painted two coats of White on White, waited for that to dry, and then taped off the stripes and painted on the red. Don’t let your nail dry too long before removing the tape. I left my index finger pretty plain and all red, and then just painted a triangle tip on my pinky. Done and done. 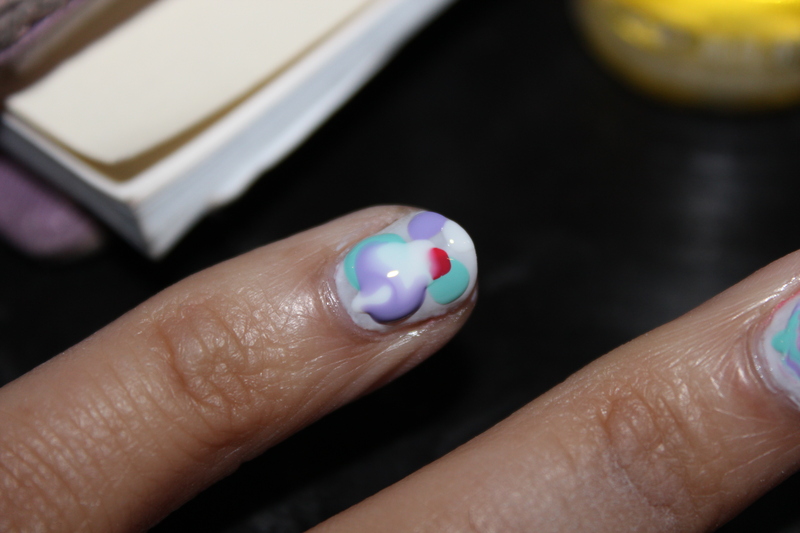 *And a word to the wise – make sure your polka dots are COMPLETELY dry, and use a thick coat of top coat, or you might end up with some weirdness (see: my left thumbnail). What do you think? 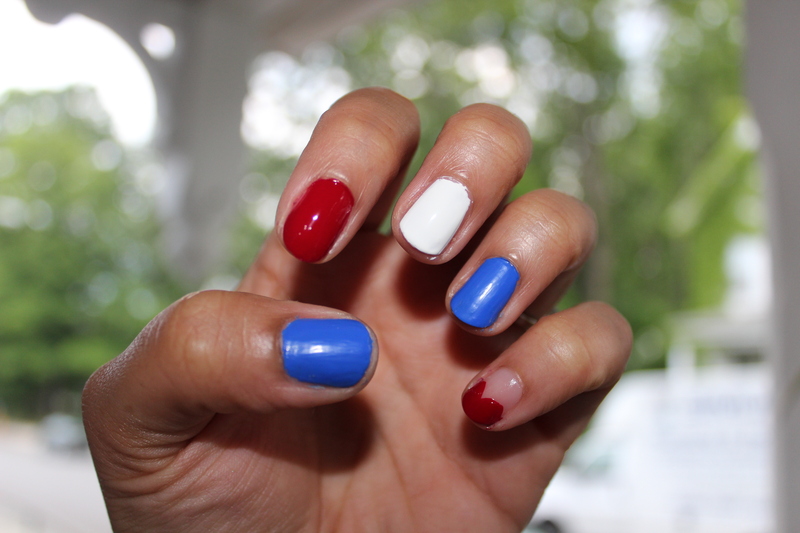 Will you be giving yourself a patriotic manicure to celebrate the holiday? What are your 4th of July plans! I’d love to hear about them! Admittedly the paint job on this one isn’t great. But if I wave my hands really fast you’d never notice. 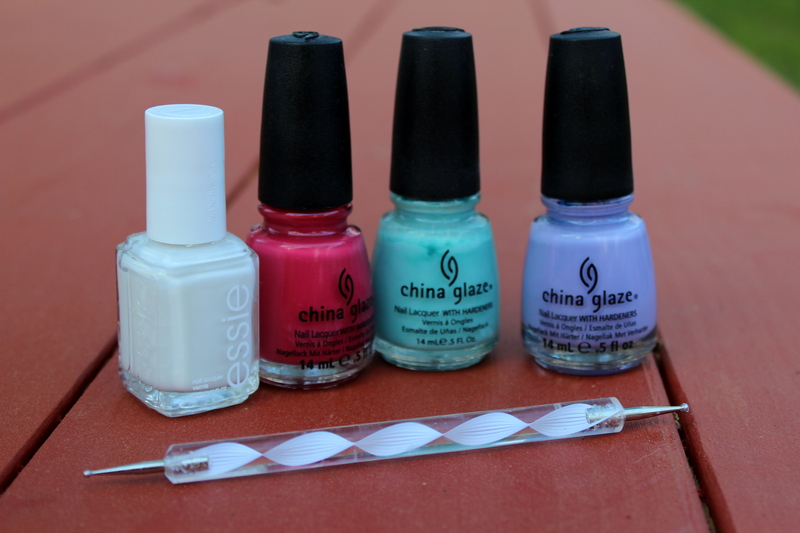 And I’m having fun gluing all kinds of stuff to my nails lately! 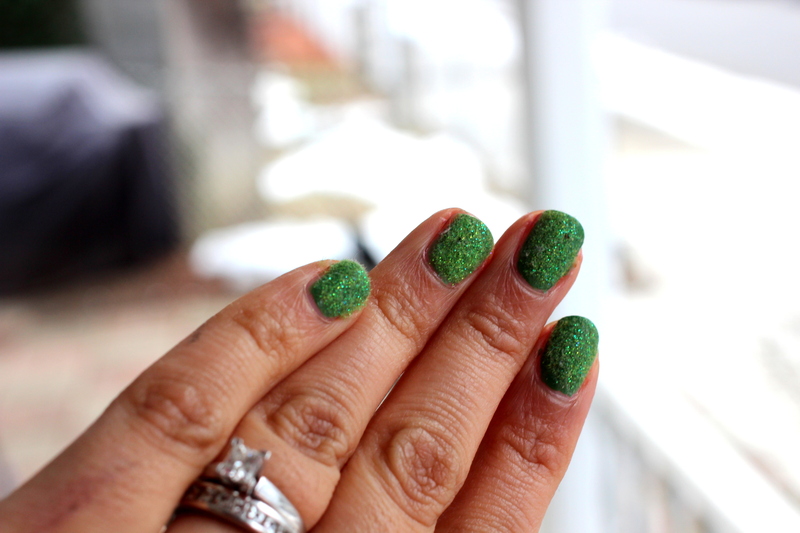 After two coats of Tart-y for the Party, I put a dab of nail glue along my my nail where I wanted to place the studs (in this case one at the base of the nail on my thumb and index fingers, and three along my ring fingers, from the base of the nail to the top). I topped it all off with a fast drying top coat. 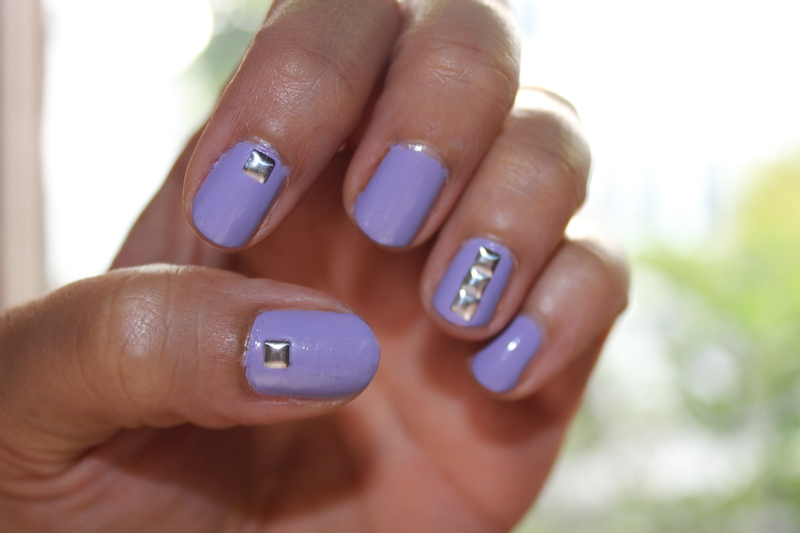 I’m loving the studded look, you might see more of them here in the very near future!